The camunda Modeler Standalone is a tool that allows you to create, view and edit BPMN process and collaboration diagrams in a seamless way. I am happy to say that the project, previously a side project of mine, is now an official part of camunda BPM. Today we released version 1.0.0 as the first stable version of the modeler. Get it now. As part of camunda BPM the camunda Modeler Standalone got its own place on camunda.org and a one-click-to-distribution build. From now on, it will be subject to our extensive QA and receive support through our forums. The camunda Modeler Standalone is open-source on GitHub. 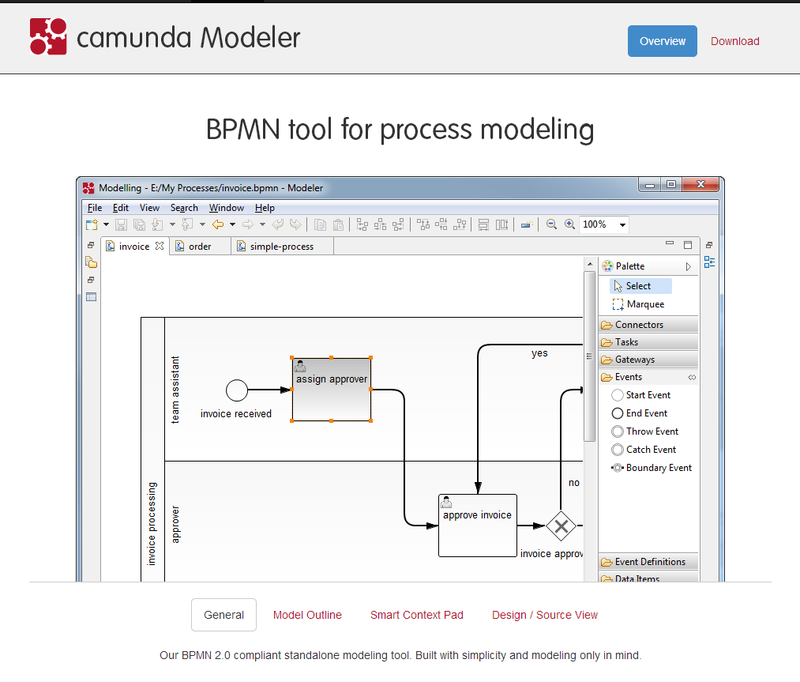 It has our camunda Modeler BPMN 2.0 plug-in for Eclipse under the hood. In fact, both share more than 95% of the plug-in code base. As a result, most new BPMN modeling features need to be implemented only once. The standalone modeler adds better operating system integration on top of the Eclipse plug-in. This includes the ability to create, open and save BPMN 2.0 diagrams directly on the file system. Furthermore it adds a source view that allows you to switch from the design perspective to the underlying BPMN 2.0 xml. Use the source view to see what is behind the graphical representation or to edit custom attributes. Windows users can get an installer for the modeler that takes care of the operating system integration. It creates an uninstaller, too, that makes sure that the BPMN 2.0 modeling tool leaves no traces whenever you decide to get rid of it. For all the Eclipse users that are using our camunda Modeler BPMN 2.0 plug-in there is no need to worry. We will keep the plug-in on par with the standalone version and vice versa. Read: Expect a new version of the Eclipse modeling plug-in with the latest changes, soon. In the mean time, try out our standalone Modeler, an offline BPMN tool that is both free as in free beer and as in open source. You like what we are doing or have ideas for improvements? Tell us via twitter or on our forums.